An Inquest into the death was held on 29 May 1987. The young man was later tried, found guilty and sentenced to prison. The hostel was at 220 Wellington Road South, Stockport, now used as offices. A non-religious memorial service was held at the St Thomas Centre, Ardwick Green North, in Manchester for his many friends and colleagues. The funeral was held later near Southampton, where his parents lived, with the reception held at the Hampshire county cricket grounds. Richard was a good friend of mine, and I was surprised about how little I could find that had been written about his life, so I started with this. This entry was posted in Uncategorized on May 29, 2015 by Tony Baldwinson. The new UK government is committed to making ‘savings’ or cuts of £12 billion in the welfare budget. This is said to exclude payments to pensioners. But perhaps one option will be to only protect pensioners living in Britain. 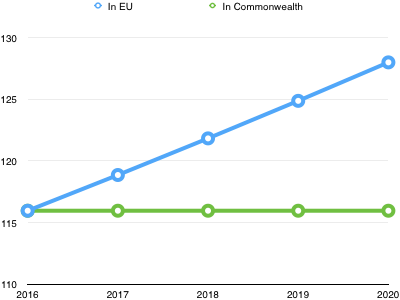 Pensioners who move abroad to Australia, Canada, New Zealand and elsewhere have their UK state pension frozen – the green line below. But pensioners who move to any other EU country get the same annual increases as if they stayed in the UK – the blue line below. Currently the annual increase is a guaranteed minimum of 2.5 per cent. There is speculation that the EU referendum will focus on non-treaty agreements such as the mutual recognition of welfare benefits. So-called “British welfare for British people”. We can expect a steady flow of tabloid newspaper articles with headlines like, “Large criminal family from EU gets £400 a week plus new house by social workers”. So, removing mutual recognition of welfare systems could be the result of the EU referendum, which then opens the door to freezing the state pension for people living anywhere outside the UK, including popular warmer EU destinations such as France and Spain. This entry was posted in Uncategorized on May 11, 2015 by Tony Baldwinson. Disabled people might lose the most in the UK referendum on EU membership. Here is how it might happen. The early signs after the UK general election are that the promised referendum on EU membership will be framed by a political message of “British welfare for British people“. The logic for the UK in framing the debate around welfare payments is that none of the other 27 countries in the EU want a new treaty, so it is politically impossible to change the wider fundamentals. Because the system of welfare payments is decided country by country, not at the EU level, it is possible to avoid asking for a new treaty. The two main principles in welfare benefits at the EU level are non-discrimination and mutual recognition. A common example is that a British pensioner living in Spain will still get their British pension. The issue of non-discrimination is very important to the EU. An example is the winter fuel payments given to pensioners. The UK is allowed by EU treaty to say that payments will be made when the temperature drops below a certain figure. It is not allowed to say that such payments will be paid to pensioners but only if they live in the UK. The effect may be similar, that people living in warmer areas don’t get the extra heating payment. But the logic is about warmth, and must not be about discriminating against their movement to another country. But the UK referendum could try to change this. This is speculation, but the change could be to say that EU citizens moving into the UK cannot have “recourse to public funds” for a number of years. So, you can continue to come here if you are rich but not if you are poor and were getting some assistance where you used to live. An example would be a care package for a disabled person. You might feel that it is already the devil’s own job to keep your care package when you move from one borough to another, or from one part of the country to another. Moving with a care package to another EU country is already even more difficult. It might soon become impossible. In the UK we could end up in a position where we say to EU disabled people: you are welcome here … but let’s see your money first. And it doesn’t take a crystal ball to guess that other countries will then say to very same thing to British disabled people wanting to live elsewhere in the EU. A solution could be that all countries agree, say, to pay for care packages up to two years of living abroad, after which it passes over to the new country. But just one example here – NHS prescriptions to people who are living abroad stop after three months, and with austerity it is unlikely that the UK would increase entitlements as part of the negotiations. The early signs after the UK general election are that the promised referendum on EU membership will be held sooner in 2016, not 2017. The logic for moving the date is to avoid prolonging the agony of endless debate and argument. An early date also reduces the time when many EU processes are put ‘on hold’ while we wait for the result of the vote. But there might not be a lot of time left to campaign for disabled people’s rights to move around the EU as freely as non-disabled people can. This entry was posted in Uncategorized on May 9, 2015 by Tony Baldwinson.